This month was highlighted by two indie gems that could loosely be described as strategy games, but are also not. They are more than that, less than that, and all the better for it. First up is one I have been looking forward to for some time. Heat Signature is the latest creation from indie developer Tom Francis, whose first game, Gunpoint, I have waxed lyrical about on the blog before. Heat Signature sees you take on the role of a space faring rogue, who is tasked with breaking into unsuspecting star ships and stealing things, rescuing people, or even potentially assassinating targets. What kind of jobs you take is up to you, but the game-play is essentially the same regardless of the objective. It's a strange game to describe, but a brilliant one. It's part rogue-like, part strategy game and part, well, something else entirely. It's real time strategy, but also almost turn based. The game can be paused at any time to plan and then queue your next action. What it does is best of all however is to create wonderful little vignettes and situations where your plans go horribly wrong and you have to improvise. There are just enough variables at play (the types of shield or abilities the guards have, the type of alarm system, environmental hazards, the layout of the ship) that chaos invariably breaks out at some stage. The alert and alarm system then adds a welcome sense of tension to most missions. It's all structured around a large campaign where you are aiming to liberate different space stations from one of the games factions. Each faction has it's own specialty and liberating their stations will unlock different gear options. You will also die, a lot, you actually take on the role of a series of would be space mercenaries, because you will be failing at regular intervals. You lose all the gear and money that character had acquired, but soon work your way up with the next. It's a neat way of enforcing different strategies and patterns of play, because just as soon as you get used to working with one stolen set of tools, you'll have to find a different set. It's great at creating those moments that turn into stories for the player. I love games like that. Some fatigue does set in the deeper down the campaign you go, as more options become readily available, but there will be so many memorable moments along the way you'll more than get your monies worth. Next up is Tooth and Tail, a wonderful little RTS-lite from the makers of Monaco. Hands up if you want to control the fates of some flamethrowing Boars, mustard gas-lobbing Skunks, and paratrooper-puking Owls. 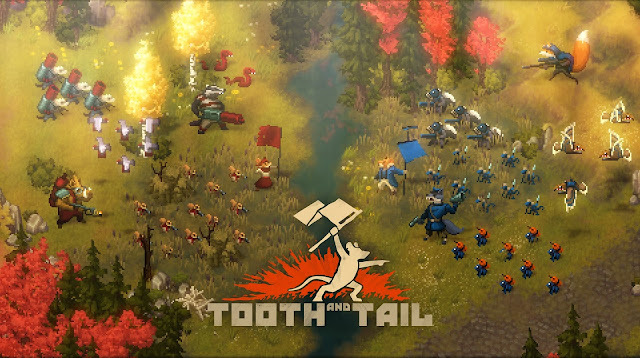 Tooth and Tail might just be something drawn from an Orwellian fever dream after reading War and Peace. It has character in spades, with a nice pixel art style. You are in command of farm animals in revolt as a backdrop to some old fashioned RTS action that seems on the surface to avoid complexity by keeping an ultra simple control scheme, and doubling down on good old fashioned rock, paper, scissors, unit strengths and weaknesses. You play the game with two buttons most of the time. The various units of sentient forest and farm critters follow the directions of your flag waving leader and will automatically engage with the enemy when in range. It's immediate and intuitive, and all about bringing forward the right combination of units at the right time. The immediacy cleverly hides a depth that is there the longer you play. Rounds are fast and furious, even in base building moments, and you're never bored. The game does a great job of keeping the pace going. Another easy one to recommend for any RTS fan. I also got started, only scratching the surface, with Divinity 2, so I'm sure that will demand some time in the month ahead. It's already hitting all the Baldur's Gate vibes. I also want to dive into Battle Chasers (which emerged this week after a successful Kickstarter campaign a while back), so just those two alone will probably keep me busy.